Harry helped me to make this simple helicopter game. We had a lot of fun making it together, and then even more fun making up and playing games with the pieces. I found a line drawing image of a helicopter on Google images and printed out six copies. Then I let Harry colour in each one in a different colour and cut them out. In the meantime, I cut out six circles from white paper to make the landing pads, and cut out a letter H for each colour. Harry glued them into place, then when they were dry I laminated all the pieces (in my household most pieces of paper that sit still for too long end up being laminated, but of course you could just make the cards of stiff cardboard, or cover them with clear sticky backed plastic). Colour matching the helicopters to the landing pads. Even though this is far too easy to challenge Harry now, he still enjoyed doing it. Find the landing pad. I placed the helicopter landing pads around the main room while Harry waited outside. Then he brought in each helicopter in turn to find the appropriate landing pad. This is a really good game for getting children to run about, and you could increase the area in which the landing pads are hidden, especially if you play outside. It is also a really good memory game, as the child needs to remember where the landing pads are that they've found for future helicopters. 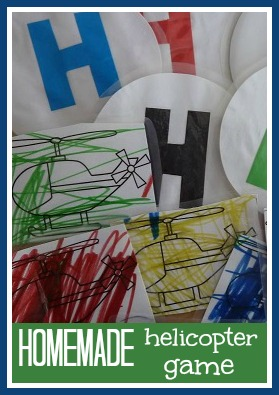 Find the helicopters - Harry loves hiding games. He will quite happily play find the helicopter over and over again. I make it more difficult by putting them out of actual sight and then doing the 'getting hotter...getting colder' thing, he is just starting to catch on. Colour matching and grouping by finding other objects around the house to place on the landing pads, like Lego bricks, pom poms and so on. I AM GOING TO MAKE THE AQUARIUM WITH MY DISABLED GRANDSON IT IS A BRILLIANT IDEA . THANKS .